Autism awareness is incredibly important, and this holiday season, you can do your part to show your support to those fighting autism on a daily basis. This awareness ornament will show the role autism plays in your life and how important it is to you. 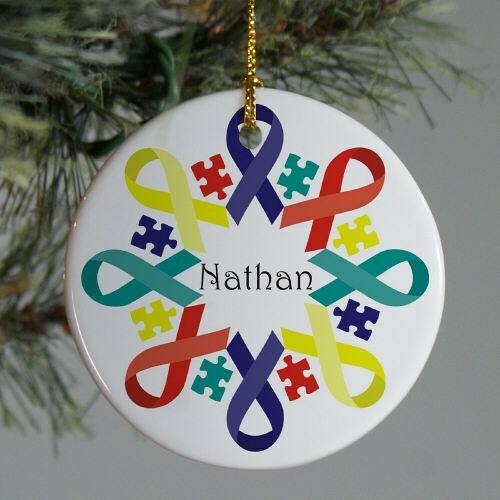 This Autism Awareness Ceramic Ornament is a flat ornament and measures 2.75" in diameter. The Ornament includes a ribbon loop so it can easily hang from your tree or ornament stand. Free personalization of any name is included. Find a variety of autism awareness products on our site and show your support in the fight against autism. Your friends and family members can join you in spreading awareness and helping us make strides in understanding autism in all its forms.